RHINO beat me to it on the rail-mount. But something else I noticed was the barrel is marked 9x21. 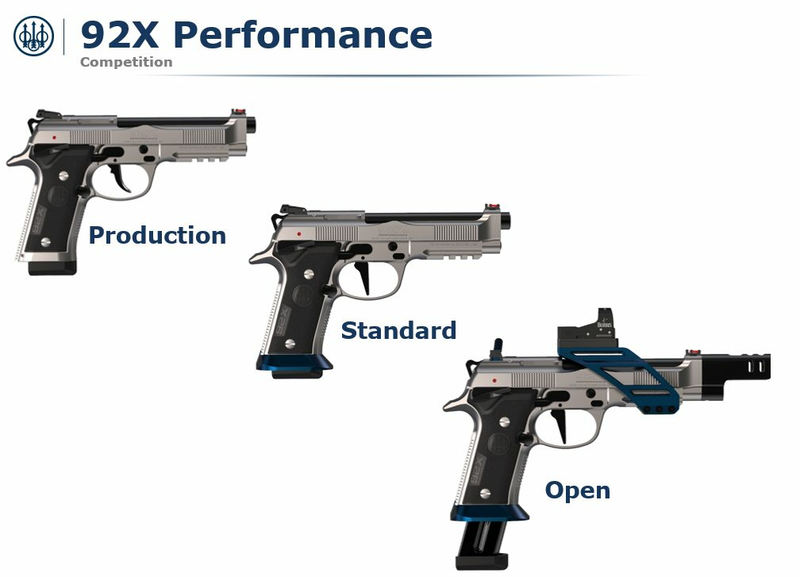 I wonder if Beretta plans to bring this to America, and how long that will take. Website states they offer both 9x19 and 9x21. The 9x19 will obviously not be offered in Italy's civilian market. and I doubt we would ever see the 9x21 version in the US. I like. It’s basically an updated 92 combat stock. Wish it had the barrel bushing and weight. The beaver tail does look funky though. I'm so glad they tell us on the frame that it'll fire without a magazine. Thanks lawyers. Can't decide if I really like it, based on appearances alone. The steel frame is cool, I'll give it that. But I know the grip angle will likely give me fits thanks to my Glock hands. I'd rather it be in black than au naturel stainless. The front serrations, at least aesthetically, don't make it for me. The tail and its droop...weird. And though a frame-mounted safety is where any manual safety should be in my book, I still don't get the actual NECESSITY for it on a DA/SA pistol, unless this thing has some ultralight DA trigger. From the product page description it's kinda hard to tell WHAT kind of trigger characteristics it has. Without fondling, it's not one for my wantlist. M9A1 all steel with a decent dehorn, Vertec Slide and Factory G. Everything else I'll tweak on my own. Target is Competition shooting, but it will be a hard pass for me. I love Berettas, especially the 92 series. I have wanted a Steel I and a 92 Combat for many years now. It’s great to see this come out though a couple things are just not sitting well with me out of the chute. First is the trigger, why is it so far forward at rest? It’s like the old toy guns. No room for your finger with double action and it looks stupid. Second, the beaver tail is ugly and seems like it would impede the highest possible grip. Lastly, that take down lever is silly IMHO. I wish Beretta would just reissue some of its older limited releases. Ugh. Perhaps I’ll like this more in person though it’s meh so far. I am not a huge fan of the vertec frame. If this came with the other frame i would be stupidly interested. Has anyone looked at the back their hand holding a pistol? The beaver tail looks like its designed to reduce recoil by taking advantage of web of your hand. If you think that's odd, by the picture... Pick up a pistol and look at your hand by the back of the tang. No, its not. The Combat is SAO and alloy frame. The Combat did not have a weight; it's a shroud for the long barrel and is alloy...not heavy at all. The Stock is DA/SA and alloy frame. This is an updated Steel-I with rail. The Steel was available as either DA/SA or SAO. Barrel bushings have been found to be not worth the hassle. More accuracy can be found by paying attention to tolerances of the fit of the barrel lugs to the frame. The accessory threaded barrels from Beretta have super tight tolerances in this regard....so much so, they need slight fitting or use to function properly. The Army Marksmanship Unit (AMU) didn't do barrel bushings...they made steel inserts to the frame and precision fit the barrels to the steel inserts. Same. I'm still not sure if I really like the Vertec frame now that I've run a few thousand rounds through my LTT Elite. For now the best combination for me is the standard 92 grip with the ultra thin LTT grips. The Vertec doesn't quite fill the hand. Well, dang. I'm in for a couple. Frame mounted safety alone made me go all giggly there for a moment. I think the match takedown lever is intended as a thumb rest. I know guys buy that sort of thing and it doesn't bother me. Never tried one sounds like a reasonable idea. I can see myself dropping in a TJIAB depending on how it is stock. At 1399 I think the trigger pull will be straight Beretta stock, nothing special. I sure would like to try that optic setup. I like the easy on and off aspect. Plus, who doesn't love 46 oz of unloaded joy. It won't replace my LTT, but it will sit right next to her. Looking at that still picture though it looks like you might have to remove front sight to mount it. That would be a buzzkill. I'm encouraged about different sized safeties. I wonder if they redesigned how they mount or of its the same as its always been. Reason being, that swapping them isn't the easiest task. I’m loving this gun! More importantly, I’m loving that there seems to be a resurgence of all steel pistols. I’m happy to pay more money for these all steel guns. I only wish Smith and Wesson would start producing their 3rd generation auto pistols again. -It is not the critic who counts; not the man who points out how the strong man stumbles, or where the doer of deeds could have done them better. The credit belongs to the man who is actually in the arena, whose face is marred by dust and sweat and blood; who strives valiantly; who errs, who comes short again and again, because there is no effort without error and shortcoming; but who does actually strive to do the deeds; who knows great enthusiasms, the great devotions; who spends himself in a worthy cause; who at the best knows in the end the triumph of high achievement, and who at the worst, if he fails, at least fails while daring greatly, so that his place shall never be with those cold and timid souls who neither know victory nor defeat. It's official. I am in love. I want, no need, one. Or two. My only even mild issue is that I have never shot a Vertec so I don't know if I like that frame or not.